Marshall Avenue and Monroe Avenue, Memphis, Tenn. Photo: John Paul Shaffer. 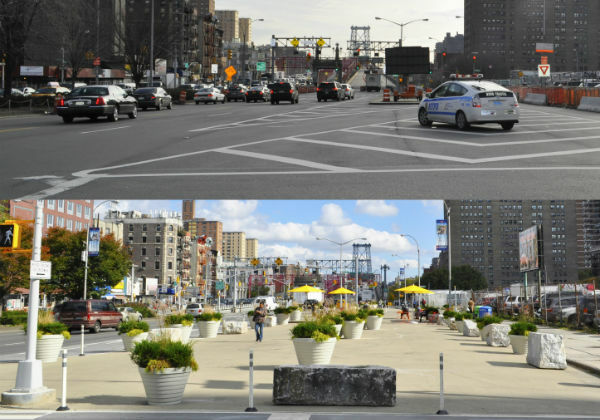 Before and after on Delancey Street, New York City. Photos: NYC DOT. Led by a city government or other public agency. Installed roughly within a year of the start of planning. Planned with the expectation that it may undergo change after installation. Built using materials that allow such changes. Within these four guideposts, there’s a broad pasture of possibility for innovative cities. You can download a print-quality PDF of our report here. Want a nice-looking hard copy to show your boss, your community group or your favorite politician? We’ve got those too. Email PeopleForBikes Marketing Manager Aisling O’Suilleabhain with a few details about who you are and how you hope to use it: [email protected]. 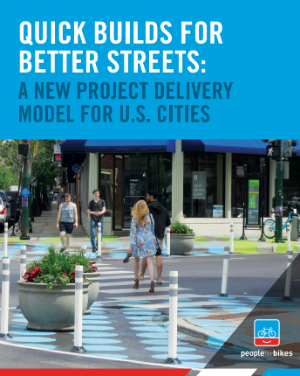 All this week on the blog we’ll be publishing case studies from the report that show what does (and doesn’t) work when cities put these techniques into practice on their streets. We wrote last year that American traffic engineering is entering its most exciting phase in decades. The same is true of transportation planning and project management. With this report we’re honored to be highlighting the work of some of the most creative bureaucrats in the country. We’ll be even more excited to watch more and more smart bureaucrats find creative ways to adopt and adapt these principles in the years to come.